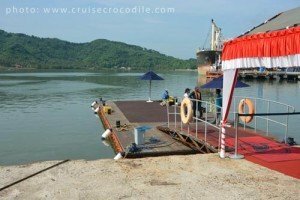 Our Lombok cruise port guide gives you information about the docking location, cruise dock, transportation options and much more! 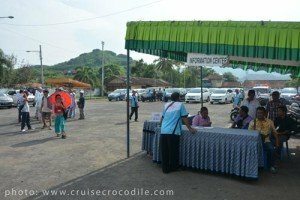 Welcome to the Lombok cruise port guide. Lombok is the Indonesian island next to Bali. It has approximately 3,1 million inhabitants. Bali is the big tourist island whereas Lombok is the unspoiled destination. Sometimes it seems like time stood still here. Now is the time to visit Lombok and explore this unrefined pure island. Lombok has nice beaches, great surfing, a lush green interior with tropical allure and the 2nd highest volcano of Indonesia. You can explore the rice, tobacco, coconut, coffee and cotton fields. Experience how the local people have lived here for the last hundreds of years and enjoy the incredible local food. For years it is has been said this is the best destination of Indonesia and now finally the island is catching up with this reputation. At the tender pier you will be welcomed by a local dance group and band. 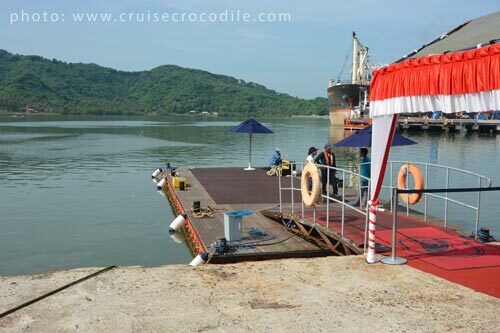 At the cruise dock you will also find a local tourist information stand. You can also arrange your taxis and exchange into local currency here. 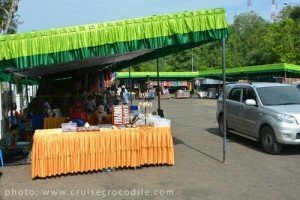 You will also find a local souvenir market at the cruise dock. At the exit of the cruise port you will find lots of people wanting to sell you a tour, scooter or whatever it is they offer. 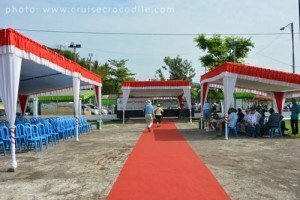 In Lombok there is no cruise dock large enough to accommodate a cruise ship. 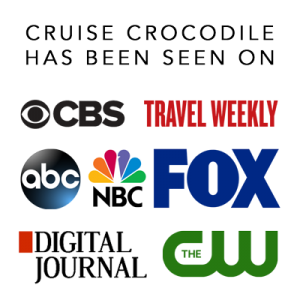 Therefore your cruise ship will drop anchor in the bay and tender you to shore. The tender dock is located at Lembar on Lombok. This is usually where the ferries from other islands come in. At the tender dock a local dance group awaits you to welcome you to Lombok. 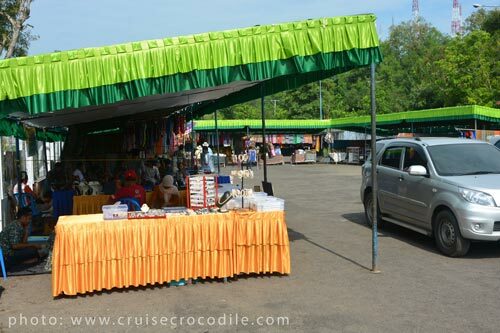 There is a small market right at the cruise tender dock where you can buy your local souvenirs. There is hardly anything within walking distance of the pier. We recommend you to go on an organised shore excursion or taxi tour. It is quite a drive to get to the main sites of the island although any drive on Lombok is amazing! Usually the locals set up a simple information centre where you can exchange your currency into Indonesian Rupiah and arrange a taxi service. Although taxis generally take US dollars your local attractions or restaurant might not. Depending on what your day ashore looks like we would recommend to change into the local currency. There will be airconditioned non-official taxis waiting for you on the pier. You can arrange them through the tourist information center on the pier. Please know there are also other taxis waiting for you outside the pier gates, which are usually cheaper than the ones waiting for you on the dock. We advice a taxi for the day should cost no more than 80 US dollars per taxi. Negotiate before stepping into the taxi. Usually locals, who hang around at the exit of the port, will be there to offer you their scooter for the day. This is a nice way to get around, although you need to be a very skilled and experienced driver to take on the hectic Lombok traffic. We would also like to emphasise that you are not insured for anything should something happen. Please take this risk into account when making the decision to make a personal deal with the local. There are no beaches within walking distance of the port. The closest beach would be around 20 minutes drive to the north. Negotiate a price with the taxi driver for a round trip to the beach. Generally the beaches on the west side are not as good as the beaches in the south although the southern beaches take longer to get to. Kuta beach (Novotel Hotel) is one of the best beaches to go to. Keep in mind it is over an hour drive / 50 km drive. 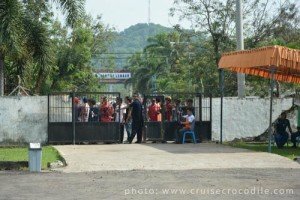 Cruise ships cannot dock on the island of Lombok. Your cruise ship will need to drop anchor and tender you to shore. The tender dock is situatued in Lembar. From here you will need transportation to get to Lombok’s sites and attractions. 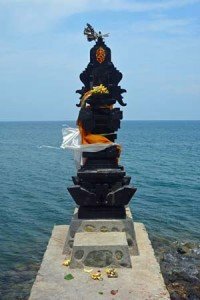 Read the full Lombok cruise port guide to know about taxi prices and what to see and do.